Land tenure issues and lack of human resources are impediments to Conservation Unities consolidation in the Amazon. Pinto, I. C., Vedoveto, M., & Veríssimo, A. 2013. 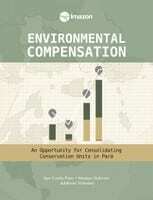 Environmental Compesation: An Opportunity for Consolidating Conservation Units in Para (p. 53). Belém: Imazon. Creation of Conservation Units (UC) is one of the most effective strategies for conserving biodiversity and reducing deforestation in the BrazilianAmazon.The State of Pará has one of the greatest territory of UCs in the world, with 67 units that total almost 417 thousand square kilometers or around one third of its territory. This area is almost the size of the territory of California (USA). Of this total, slightly over half or 213 thousand square kilometers (21 UCs) are state UCs, while another 203 thousand square kilometers (46 UCs) are federal UCs. Despite the extensive territory protected by UCs, many challenges remain for guaranteeing consolidation of these areas. One of the greatest obstacles is the scarcity of public financial resources for implementing them. One of the most promising alternatives for solving this problem is environmental compensation, an instrument established by the law for the National System of Conservation Units (Snuc). This instrument calls for earmarking a percentage – initially a minimum of 0.5% – of the total cost of enterprises that generate significant environmental impacts (dam construction, mining, petroleum and gas projects, etc.) for full protection UCs, such as Parks, Ecological Stations (Esec), Biological Reserves (Rebio), etc. Despite being guaranteed by law, a Direct Action for Unconstitutionality (ADI) was raised in 2008 to challenge environmental compensation. The Federal Supreme Court (STF) ruled on this suit and recognized the constitutionality of environmental compensation, but also eliminated the minimum charge of 0.5%. On the other hand, in 2009, a federal decree set the maximum value to be charged at 0.5%. However, some States have adopteddifferentvalues,asisthecasewithPará, where the percentage varies from 0.1% to 2.0%. The State of Pará has the potential to receive significant revenue from environmental compensation. This is because the total value of venues already licensed investments from 2000 on and planned up to 2014 totals about R$ 140 billion (about US$ 70 billion). Our estimate for collection from compensation varies from a minimum sum of R$ 720.7 million (about US$ 360.4 million) assuming 0.5% as the rate up to R$ 2.2 billion (about US$ 1.1 billion) considering a rate of 1.5%. Of that total, around 39% would be collected by the Pará State Government while 61% would be by the federal government. We were not able to classify a mandate for licensing (state or federal) for slightly less than 1% of the funds. These estimates provide Pará an opportunity for establishing one of the largest environmental compensation funds in Brazil. Even without yet having a state fund for environmental compensation, Pará was a pioneer in regulating charges for compensation when in 2007 the state received R$ 54 million from Alcoa (about US$ 27 million) the first company to sign a cooperation agreement with Sema. This amount was destined for the Pará State Environmental Fund (Fema). Given the significant potential for collecting the estimated environmental compensation, we suggest that Pará Government adopt a model for an Environmental Compensation Fund (FCA) based on the system adopted by the State of Rio de Janeiro, the Atlantic Forest Fund (FMA). The FCA in Pará State needs to have essential characteristics such as transparency and social control, participatory governance, agility in transferring funds directly to the UCs and the potential for bringing in other revenue such as environmental fines, Terms for Adjusting Conduct, donations, etc.. Additionally, it should have the capacity for obtaining funds from foundations and international governments in ordertodiversifythecapitalcollected.Advances towards creating an FCA depend on major efforts by the Pará Government itself. The December 2012 signing of a Technical Cooperation Agreement (ACT) between Sema and the Brazilian Fund for Biodiversity (Funbio), an institution with broad experience in managing environmental conservation funds, is an important step towards creating the FCA in 2013.